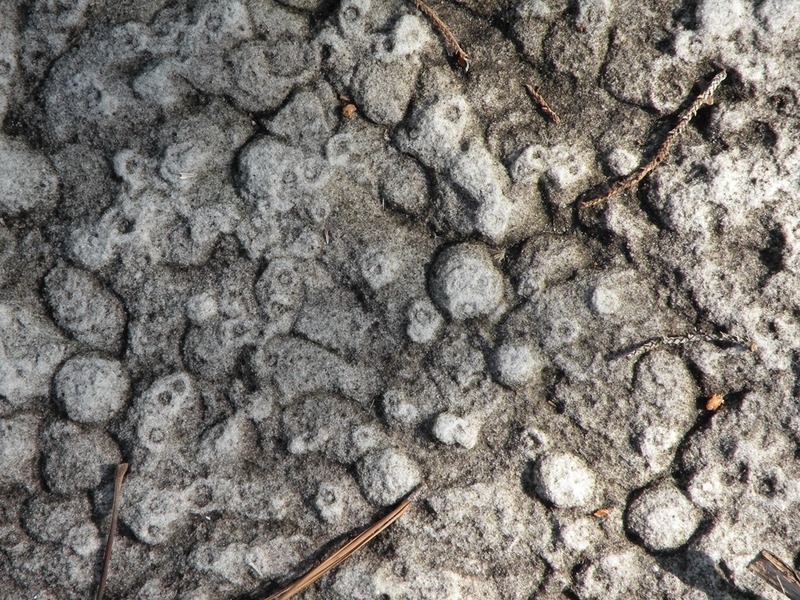 The photo above shows a vertical dark rock in the center of flat-lying white rock. The dark rock is a sandstone deposit, probably Mississippian-aged, and the white rock is Silurian-aged limestone. If one were to follow the sandstone dike upward, it would lead to a sandstone bed sitting on top of the limestone. 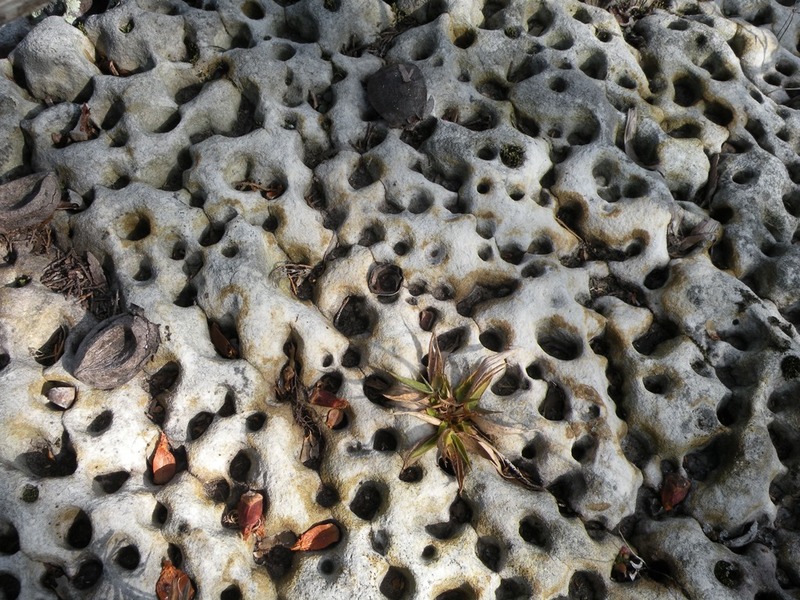 Since the limestone was deposited first, we can infer that it was exposed to weathering. 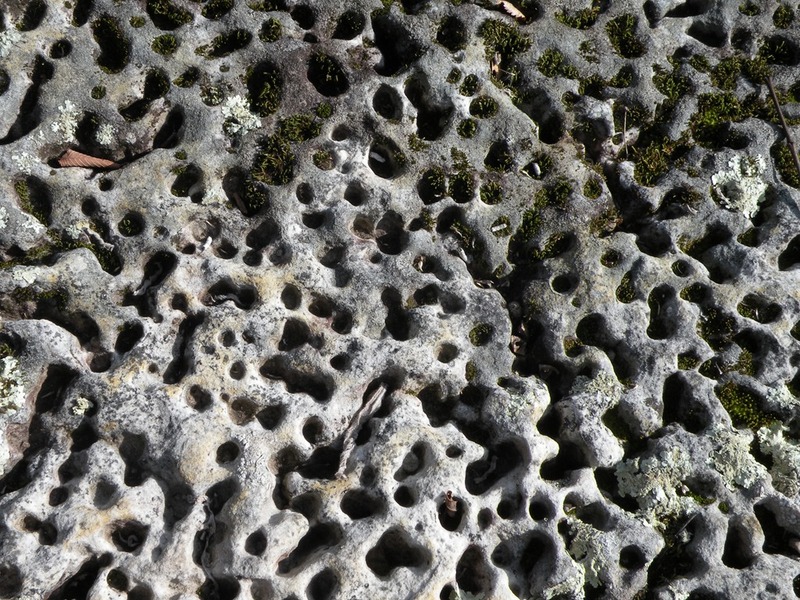 The limestone was solutioned and deep fractures or cracks formed. Afterwards, sand was deposited in the area, filled the fractures in the limestone, and eventually lithified into sandstone. 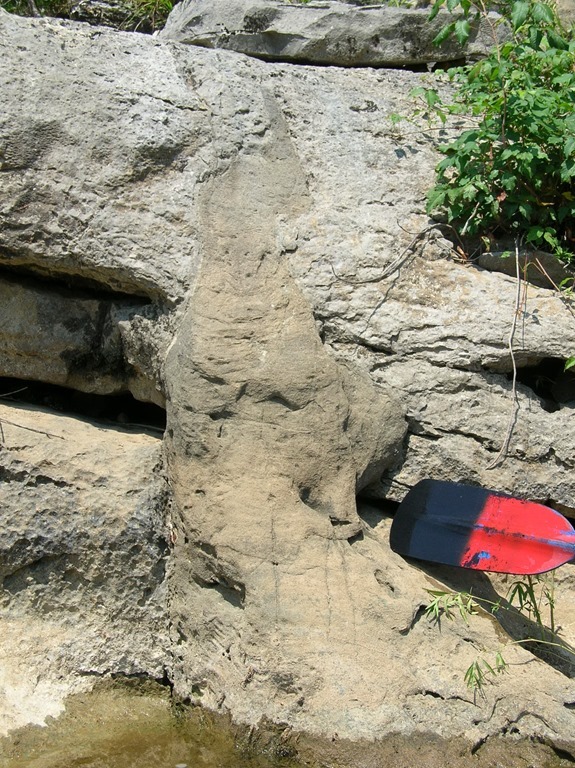 There are several of these sandstone-filled fractures present along the Buffalo National River in Silurian-aged limestone. The one pictured above is located at Shine-Eye. 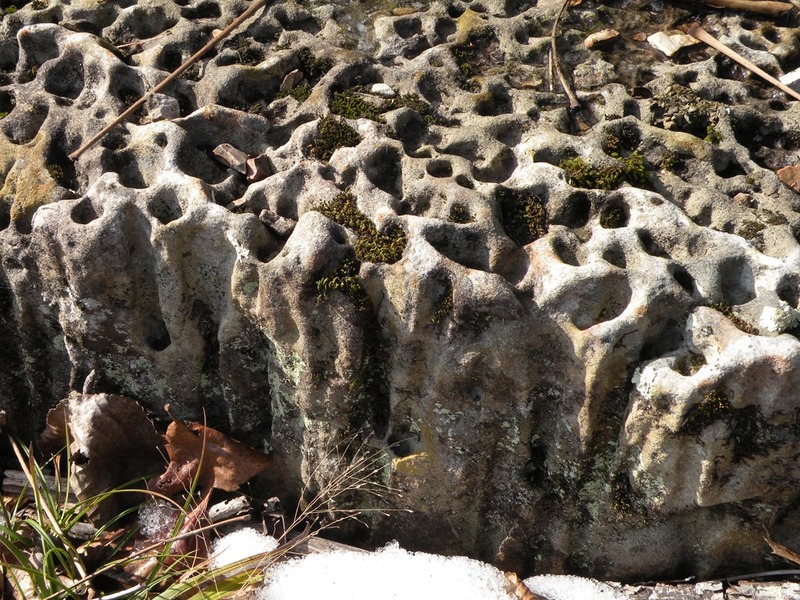 This entry was posted in #geoblog, GeoPic of the Week, Sedimentary Features and tagged Buffalo National River, Carboniferous, karst, mississippian period, Paleokarst, paleozoic, Shine Eye, Silurian Period, Unconformity on January 14, 2019 by argeology. 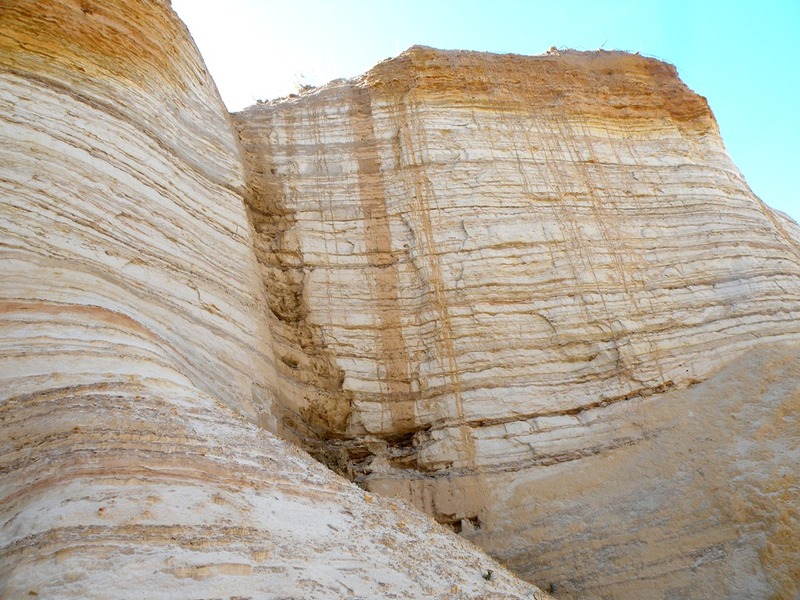 This rather handsome outcrop of the Wilcox group consists of alternating layers of sand and clay of the Eocene Epoch which lasted from about 56-34 million years ago. The Wilcox Group is a non-marine unit mostly composed of sand with lesser clay, silt, gravel, and lignite (low-grade coal). 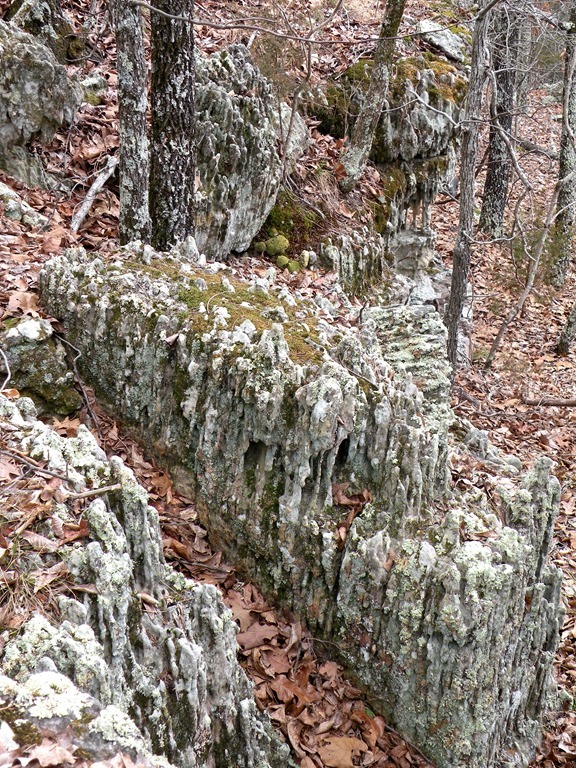 This geologic unit is part of a larger sequence of loosely-consolidated sedimentary rocks exposed in south central Arkansas, south of Pulaski county. 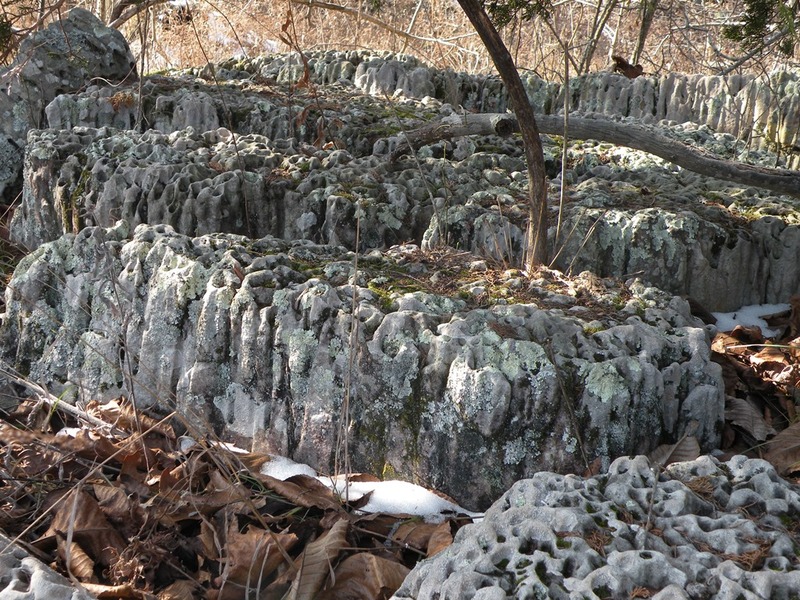 These rocks are the northern extent of the West Gulf Coastal Plain, a physiographic province that stretches from central Arkansas, south, to the Gulf of Mexico. This entry was posted in #geoblog, GeoPic of the Week, Sedimentary Features and tagged Arkansas, Bedded rock, Cool outcrop, Eocene, Geology, Gulf Coastal Plane, Wilcox Group on December 13, 2018 by argeology. Why do rocks have beds? Are rock beds where geologists sleep? Sometimes, but that’s not the point of this article. 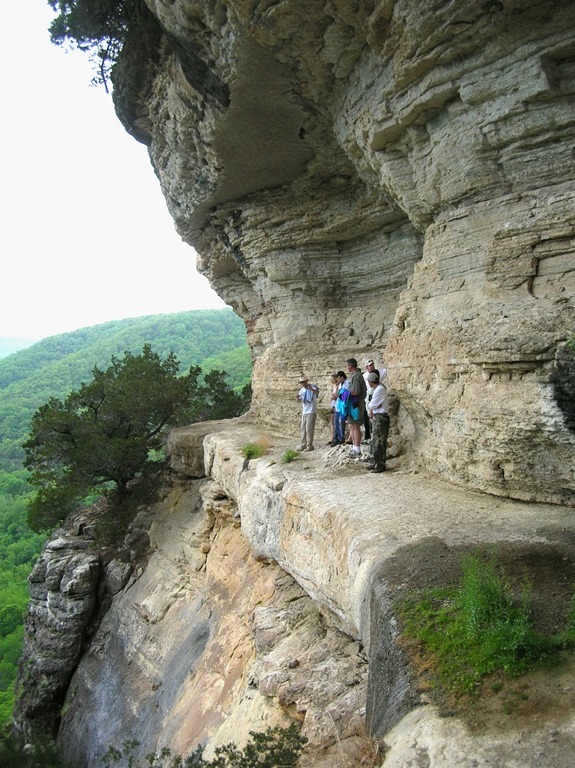 The picture above, taken on the Goat Trail at Big Bluff, overlooking the Buffalo National River, is a great example of a sedimentary rock composed of many individual beds (layers). The reason that rocks are bedded is due to either gaps in deposition or abrupt changes in the grain size of sediment being deposited in an environment. Here’s an example; when a storm causes a river to flood its valley, the water deposits sediment as the flood recedes. Typically, there’s a period of non-deposition before the next flood event deposits a new layer of sediment over that one. This time between floods allows weathering to alter the character of the first flood deposit. That weathered surface will eventually differentiate the flood deposits into distinct beds of rock. Bedding can also form as a result of flowing water gaining or losing velocity. The size of sediment that water carries (and eventually deposits) is directly related to flow rate. A sudden change in flow rate creates bedding distinguished by differences in grain size. This entry was posted in #geoblog, GeoPic of the Week, Sedimentary Features and tagged Arkansas, Big Bluff, Buffalo National River, Geology, geoscience, Goat Trail, Natural beauty, Ozark Plateaus, sedimentary rock on October 11, 2018 by argeology. 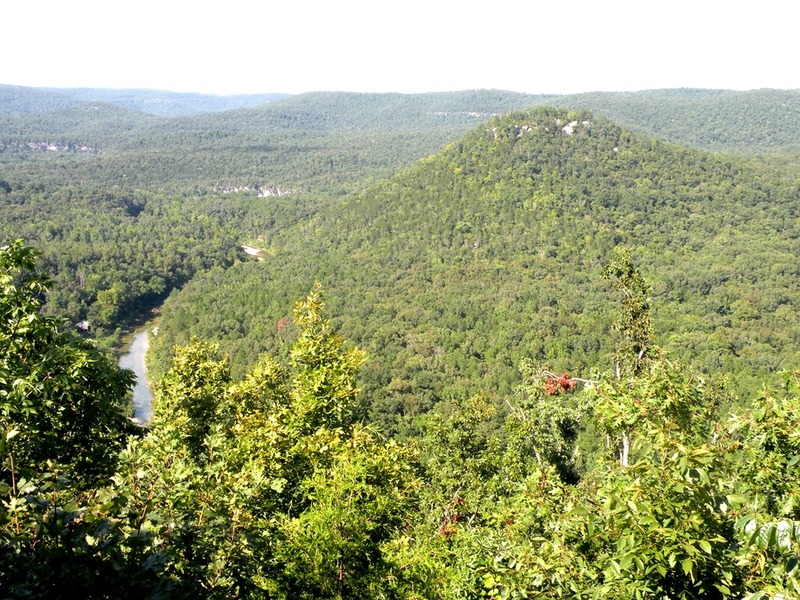 If you live in Arkansas, chances are you’ve heard of the Ozark Mountains. Actually, the correct geologic term is Ozark Plateaus. 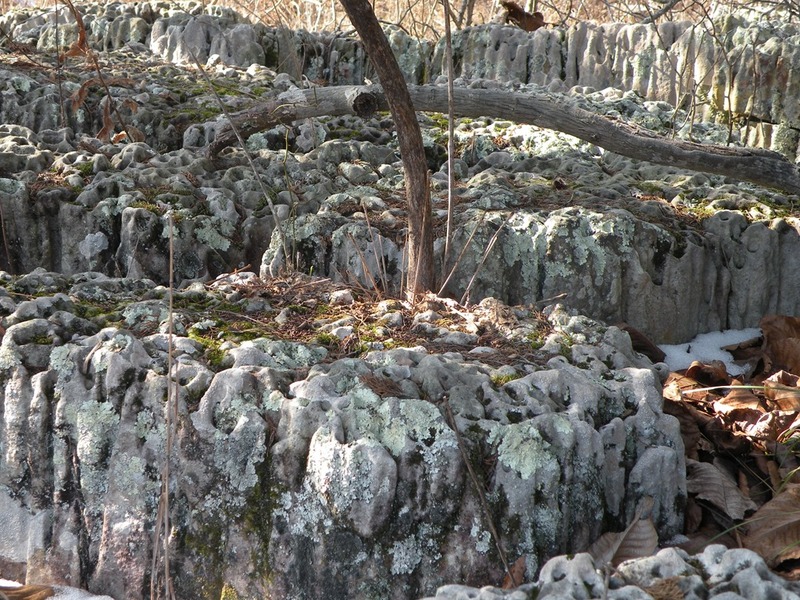 Unlike typical mountains in which the bedrock has been squashed and folded, the Ozarks are one broad dome-like structure made up of flat-lying sedimentary bedrock. The hills and valleys of the Ozark topography are the result of rivers carving into this dome, rather than compression or deformation. The picture above was taken overlooking the Buffalo River. The various hills, from the foreground to the distance, are roughly the same height. Of course they are! If not for this and other rivers, the landscape pictured here would be one solid flat surface, as tall as the highest peaks in the picture, stretching to the horizon. This entry was posted in #geoblog, GeoPic of the Week, Sedimentary Features and tagged Arkansas, Buffalo River, erosion, Geology, Mountains, Ozark Mountains, Ozark Plateaus on February 16, 2018 by argeology. This entry was posted in #geoblog, More Views, Sedimentary Features, Trace Fossils and tagged Arkansas, Buffalo National River, Geology, Marion County, Skolithos, Trace Fossils on January 26, 2018 by argeology. 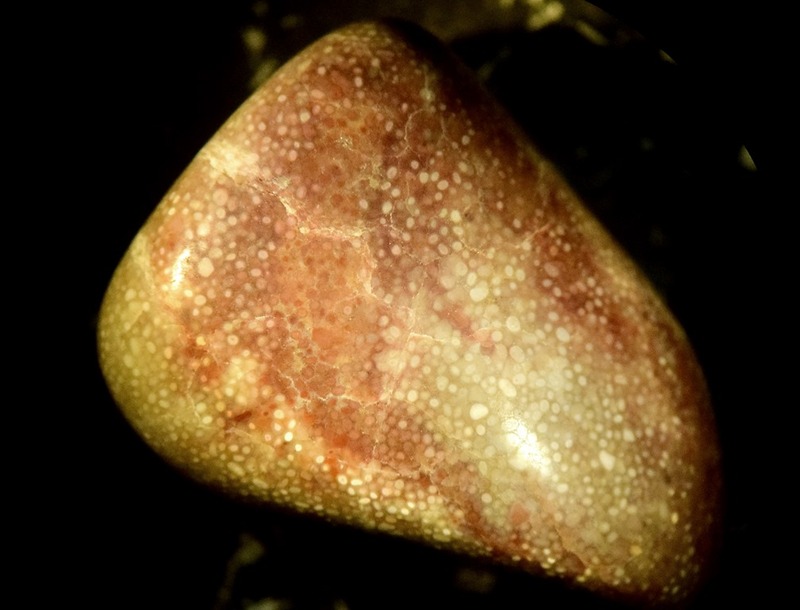 Skolithos is a common type of trace fossil that has been found in rocks as old as 541 million years. 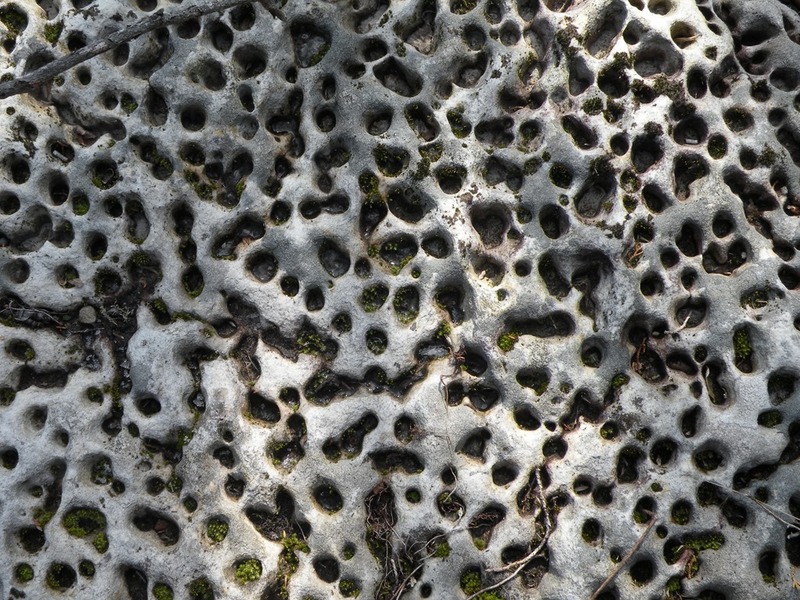 Trace fossils are not the fossilized remains of organisms but rather the burrows, footprints, and other structures that resulted from the animal’s activities. In the case of skolithos, it’s widely believed that a vermiform (resembling a worm) animal created the straight, vertical, tube structures. These worm-like critters probably lived by filtering plankton from the turbulent water of a shallow marine environment. The vertical tubes may have been a dwelling place to retreat to, though their specific purpose is not known. 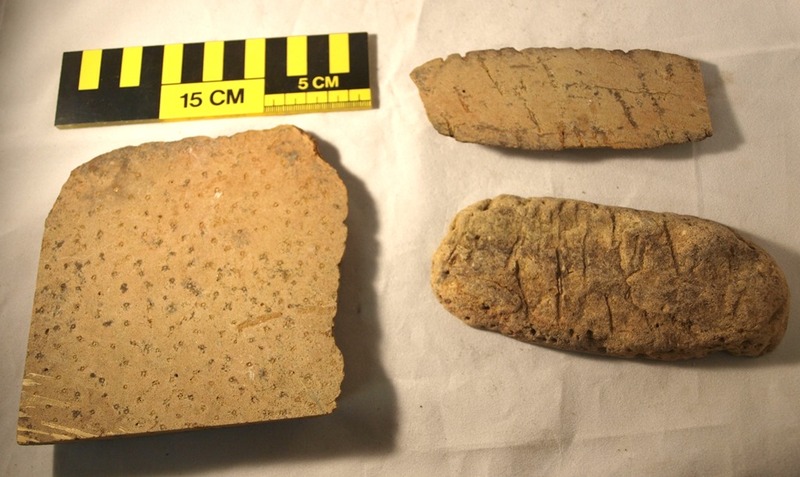 In the above picture, captured in north central Arkansas, a sandstone has weathered to reveal skolithos traces permeating the approximately 460 million year old rock. This example is from an exposure of the St. Peter Formation, Buffalo National River Park, Marion County, Arkansas. This entry was posted in #geoblog, GeoPic of the Week, Sedimentary Features, Trace Fossils and tagged Arkansas, Buffalo National River, Marion County, Skolithos, St. Peter Formation, St. Peter Sandstone, trace fossil on January 26, 2018 by argeology.